We love us a family affair! Especially when that family is the Bennett family. 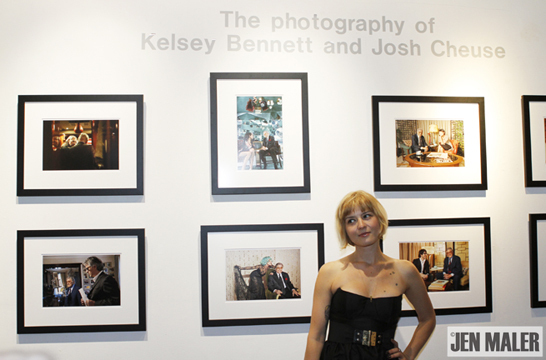 Last night the Morrison Hotel Gallery in SoHo was packed as photographers Kelsey Bennett -- granddaughter of beloved crooner Tony -- and Josh Cheuse, who were debuting their photography exhibit centered around Bennett's grandpa's new album Duets II, which also dropped yesterday. Jesse Malin, Bob Gruen, Ann Dexter Jones, Jim Jarmusch, Scott Lipps, Tiffany Limos and Prabal Gurang all came out to show their support. 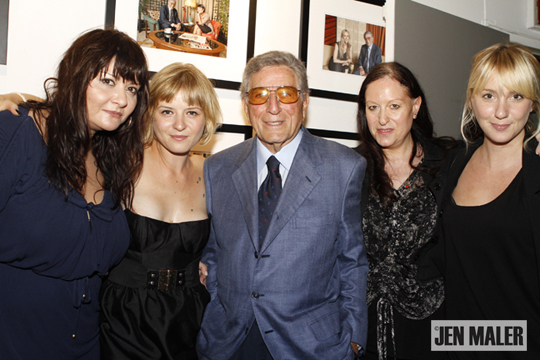 The photos in the exhibit followed Tony from Italy (the birthplace of his father), singing on mountaintops, to the studio, where he recorded in recent years alongside Lady Gaga, John Mayer and the late Amy Winehouse. We spotted Kelsey, who was bouncing around the room with her blonde bob, hugging family members and greeting friends, and had to ask her about the odd cartoon-girl tattoo on her inner arm: "I wanted to get a tattoo that I would regret. The whole stigma with tattoos is get to something that you won't regret." So what does grandpa Tony (who made a short appearance at the opening) think of her tattoos? "It's all art to him," she says.